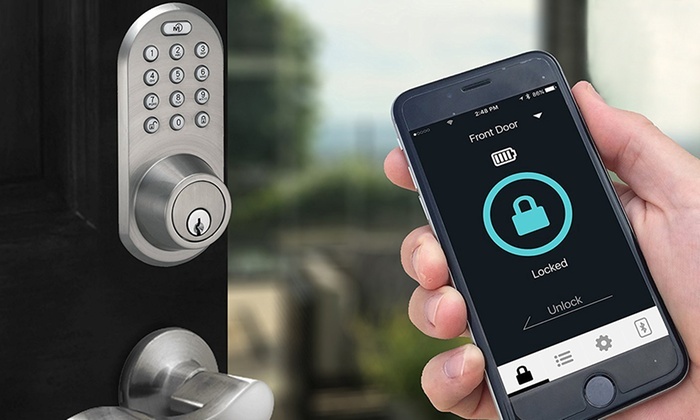 Considering a Keyless Entry, Smart Lock or Electronic Door Lock? Look no further than Access Locksmith in Charlotte, NC. With over 30 years’ experience and a master locksmith status, we can install the perfect keyless entry system for you. Whether you are looking for a electronic door lock, keyless deadbolt and/or keyless entry system you can operate with your smartphone, we can help. Call today for a free quote at 704-455-6707. While it’s very easy to overlook the importance of doors and locks around your residential or commercial premises, the fact of the matter is that they should be considered a priority at all times. Although you might not appreciate their integral function and value when the systems are working well, you’ll certainly regret not having the right systems in place should problems ever surface. 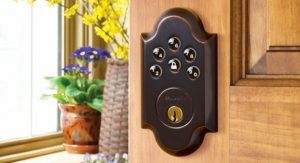 Your Charlotte, NC properties deserve the best, and keeping your doors and locks in perfect condition is vital, and that means moving with the times to incorporate the latest systems. Keyless technology opens the door to a better future for your home or business premises. Here’s everything you need to know about keyless entry points and what they can do for you. Keyless entry systems are pretty self-explanatory. The most basic definition is that they are access points to various parts of the business that do not require the use of keys. Essentially, they are doors that do not require the manual locking mechanism that your property currently uses. This doesn’t mean that your doors can suddenly be opened by anyone. In fact, the opposite is true as keyless entry systems actively promote better protection. Instead of merely using keys, advanced technology is used to grant and restrict access like never before. Quite simply, this is the future of modern door security in business as well as the home. Are Your Assets Currently at Risk? Whether you’re a homeowner or a business owner, the thought of letting people steal your assets or infiltrate private locations is nothing short of a nightmare. With this in mind, you’ve probably taken great precautions in other aspects of your security. This could include adding CCTV and alarm systems, as well as a host of other features. However, it would be safety suicide not to pay attention to the doors and access points. After all, these items form the most important line of defense. The harsh reality is that over two in three data breaches are attributed to stolen data endpoints, with insiders usually at the heart of those dangers. Those endpoints include laptop computers, laptops, smartphones, memory sticks, CDs and any other mobile device that is capable of storing data. When those items are stolen, it can lead to lost intellectual property and identity fraud, which are both things that you’d rather avoid. So, if you’re still plodding along with outdated manual systems, now could be the time to act. Let’s face it; suffering such a truly horrendous situation when it could be prevented defies all logic and sensibility. Why Opt for Keyless Entry? Incorporating keyless entry systems into your home or business premises might not cost the arm and leg that you expect it to, but it’s still an expense. Therefore, you need to gain the reassurance that this is a worthy investment that can actively help your business. Here are just some of the compelling reasons to make the transition from outdated mechanical entry points to the modern keyless alternative. First and foremost, upgrading your facilities to a keyless entry system will improve the security of your home or business. Nobody will be able to gain unauthorized access while this option also removes the danger of keys falling into the wrong hands due to theft or misplacements. Perhaps more importantly, utilizing keyless facilities means that doors are automatically locked after being shut. When sticking to manual key solutions, it’s not uncommon for employees or family members to leave the home or workplace without locking the doors. With keyless options, your assets no longer need to be at risk. Aside from the physical benefits of keeping valuables protected, opting for a keyless locking system alleviates any fears regarding vulnerabilities. The ability to update the technology allows you to alter the permissions as and when it is needed. This is particularly useful if an employee leaves on bad terms. If they still had the key, there would always be a concern that they could come back to cause damage. With keyless facilities, you can simply remove those permissions to get your security back to its best. The knowledge that maintaining that feeling of security is ease can only have a positive impact. Time is money and wasting your time thanks to the use of outdated locks and deadbolts just won’t do. With keyless technology, everybody that has access to the rooms and workspaces will reap the rewards of increased convenience. This also removes the problems that surface from losing keys. Meanwhile, there’s no threat of keys getting jammed or snapped in the lock. Employees can enter and exit the appropriate parts of the building with minimal fuss while they’ll also know that nobody without authorization can enter. And when all issues regarding access points no longer exist, it enables staff members to focus solely on work matters too. In the world of business, appearances count for everything. Upgrading to a keyless entry system is another example of your company incorporating the latest and greatest tech facilities. This instantly creates an even more significant impact on customers and employees alike. There’s no doubting that keyless entry points look extremely cool and futuristic, giving your business a touch of the wow factor. Likewise, those systems can have a huge impact around the home, making you the envy of your friends and neighbors in one fell swoop. This is sure to put a smile on your face and improve your relationship with the property. In addition to the immediate benefits gained from incorporating keyless technologies, you’ll also reap the ongoing rewards of more natural management. After all, it’s not just about keeping the premises secure for the short-term future. You also need to protect it for the long haul. When choosing traditional key locks, the only way to truly update the system is to change the locks and get new keys cut. With a keyless solution, updating the systems to bypass those particular issues becomes a particularly simple task. This means that the advanced facilities can serve your needs for many years to come. Keyless entry points are the future, and now is the time to act. The short answer is that keyless entry simply allows you to open and lock doors without keys, ensuring that those who should have access can navigate those spaces with ease while those who shouldn’t have access cannot. However, different systems and models can work in slightly different manners. Either way, though, it’ll provide your Charlotte business (or home) with the next level security you deserve. Keypad locks replace traditional locks by utilizing a series of buttons that grant access once the user has tapped in the right sequence. This works in a similar manner to briefcase locks and other systems that you’ve seen elsewhere. The series of buttons can be displayed as numbers or as letters. With millions of potential combinations to choose from, the chances of someone guessing the right sequence are virtually non-existent. Meanwhile, doors are automatically locked once shut. This gives you far greater protection than a normal door lock as intruders would just need to find a key or try opening the door once somebody has forgotten to lock it. Another benefit of using keypad locks is that you can easily reset the password or pass-code whenever it feels necessary. So, you can quickly restore the sense of security even if an ex-employee leaves on bad terms or someone unauthorized finds out about the current code. Keyless door locks don’t even use a keypad for entry. Instead, they can utilize digital technology to be opened by smartphone Apps or specialized devices. In advanced cases, you could even use fingerprint technology to significant advantage. With keyless technology, those with access can get into rooms or locked off areas with the touch of a button. Aside from being quick and removing the need for keys, it’s also very useful when they are carrying items. As with keypad locks, the fact that doors are automatically locked once shut gives them an advantage over traditional door systems. Additionally, if the device was accidentally left in the room, the doors can be opened remotely by the administrator. With standard doors, you’ll have to find another key. From the business owner’s perspective, there are many features that make this a great option. Apart from only granting access to those that should have it, you can also restrict their times of access. So, if an employee should only be allowed in at certain times, the management facilities allow this to happen. Whichever solution you opt for, there are a variety of extra features to choose from, which gives you the ultimate sense of personalization. Keeping your business or home environment in a safe place has never been so simple. Some business investments are reserved for huge and established companies while others are only useful in certain locations. Keyless access facilities are suitable for virtually all companies in North Carolina, irrespective of size or industry background. Essentially, if you have assets that are worth protecting, this is the perfect solution to enhance your security features. Keyless solutions can be used in office spaces, warehouses, stock rooms, meeting rooms, and data centers. Similarly, those products and tech features can be used regardless of whether the company has five employees or 500. However, it can be a particularly useful solution when you deal with a large number of employees that may require access to areas. After all, cutting several keys can be costly and time-consuming, especially as it saves the hassle of getting the locks changed. Whether you want to protect the main access points, or section off an area of the building that holds the most valuable assets doesn’t matter either. Keyless technology is the best solution and can transform your entire business for the better. Furthermore, there’s never been a better time to make the transition. Now that you’ve seen the benefits of incorporating keyless entry points throughout your business, you’re probably ready to take advantage by adding those facilities ASAP. The next – and arguably most important – step is to choose the right team of professionals to make it happen. With Access Locksmiths, your home or business is in safe hands. Our team of friendly and experienced technicians can take care of every aspect from conception to completion. Whether you already know what you want from keyless technologies or need a little support throughout the decision-making process, we are ready to turn your visions into a reality. Here are just some of the reasons to choose our services. We have worked with businesses and homeowners throughout Cabarrus County and the Charlotte area for over 30 years, boasting a wealth of knowledge and experience in all fields relating to locksmith duties. Keyless entry has become an increasingly important part of what we do in recent times, and we boast all the skills, tools, and resources needed to take your security and convenience to the next level. Aside from a quick and professional installation, we’ll provide the support needed to make the most of those new facilities, including how to manage and update them as time moves on. In turn, you’ll receive the proper protection that you deserve. Take the first step enroute to creating a modern home or working environment today by calling Access Locksmith at 704-455-6707. From discussing the specifics of your project to implementing the latest and greatest facilities for years of increased security, ours is the only service you’ll need.